REFER TO TABLE: DESCRIPTION OF TRAINS IN ORDER OF DEPARTURE. Jim Bridger piloted the first train from the cutoff west of Red Buttes on May 20, 1864. His party included Reverend Learner B. Stateler, whose written account of this trip is the only one known to exist. The train consisted of 62 wagons and approximately 300 men, "organized under the guidance of Major Bridger . . . and traveled in military order. Mounted men went before and followed behind. . . . they would make one move . . . each day, traveling until about three or four o'clock in the afternoon." A small train departed along the Bridger Cutoff a few days behind Bridger's first party. 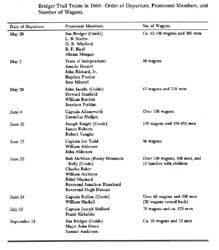 This party, known as the Independents in the diary entries, consisted of 10 wagons. The men in this train were experienced traders and needed no guide, especially if they were only a few days behind the trace being made by Bridger's large train. John Richard Jr., Baptiste Pourier, interpreter Amede Bessette, and Jose Miraval were the prominent members of the party. Richard was the half-Sioux son of John Baptiste Richard Sr., who constructed the lower Platte Bridge on the Oregon Trail, 6 miles east of old Fort Caspar, in time to serve the heavy emigrant traffic in 1853. Richard Sr. was an early prominent trader on the North Platte River. In addition to running the bridge, he operated a trading establishment that included a grocery and dry goods store and a blacksmith shop until 1865. John Jacobs led the second large train over the Bridger Trail, departing the cutoff on May 30, 1864. Jacobs had been with John Bozeman on their first exploration of the Bozeman route early in 1863. Later that same year, he accompanied Bozeman when they guided the first train of emigrants up the Bozeman Trail until the Sioux forced them to return south to the main Oregon Trail route. Howard Stanfield, a young traveler from Indiana, accompanied Jacobs' train. He and other members of the train referred to Bridger's route as the "Yellowstone Cutoff." The third large train took the Bridger Cutoff on June 4, under the leadership of Captain Allensworth. Cornelius Hedges, one of the members of the train, provides the principal source of information regarding the day-to-day events experienced by this party of travelers along the Bridger Trail. For a trail pioneer, Hedges was very well-educated. He had earned a degree from Yale, studied law at Harvard, then became both a lawyer and newspaper publisher in his home state of Iowa. He was destined to become a prominent figure during Montana's territorial period and early statehood. "Cattle train started out at 4--we didn't start till 7, more teams came in today Our train is over 100 now." By June 10th another large train was assembled for departure on the Bridger Trail under the leadership of Joseph Knight. Knight had been on the North Platte River since at least 1854, when he was employed to work on Richard's bridge, and he remained in the region as a trader. James Roberts and Robert Vaughn were members of this train. Roberts' diary is one of the principal sources outlining the details of this train. William Alderson and his brother John emigrated from Illinois and were members of one of the smaller trains that took the Bridger Cutoff on June 15. The train consisted of 46 wagons: 12 horse-drawn wagons, 16 ox-drawn wagons, and 18 mule-drawn wagons. The members of the train chose Joe Todd as the captain. One week later, two school teachers were members of a train consisting of approximately 100 wagons that departed the Bridger Cutoff on June 22. Charles Baker and William Atchison emigrated from two small communities in northern Illinois and may have known each other prior to the formation of their train near the cutoff. Both men kept detailed diaries describing their trip along the trail to Virginia City. Ethel Maynard and Reverend Jonathon Blanchard, president of Wheaton College in Illinois and a prominent Presbyterian and Congregationalist minister, were also members of this train. Trader Bob McMinn, known as Rocky Mountain Bob to the diarists, was their guide. William Haskell's train, under the leadership of a Mr. Rollins, departed the Bridger Cutoff two days after Baker's train. On June 24, Haskell's party "[d]rove seven miles and then laid by [near Red Buttes] for wagons to come up to make a sufficient Company to go through the Bighorn Mountains safely; tonight we have over sixty wagons and about two hundred men. Elected Mr. Rollins, Captain of the train; we leave the old road after four miles and take Bridger's cut-off." Haskell's party probably crossed the North Platte River at Richard's bridge instead of the upper Platte Bridge, because he drove 14 miles to reach the point where they laid over to await additional wagons; the upper and lower bridges were about 6 miles apart. They "paid five dollars each for the wagons and fifty cents each for loose stock." Not all the people in Haskell's train were comfortable remaining on the Bridger Trail. On June 27, Haskell wrote, "Thirty wagons turned back to take old road." Frank Kirkaldie was a member of yet another train that departed Red Buttes on July 13, for the Bridger Trail. Kirkaldie had been a marble cutter in Vermont, and later, unsuccessfully tried farming in Illinois and Iowa before coming west to seek his fortune. Kirkaldie could not afford an outfit of his own, so he hired out as a teamster for a party organized by a Colonel Munger and he headed west, leaving his wife and children behind in Des Moines, Iowa. Kirkaldie's letters to his wife provide yet another account of travel on the Bridger Trail in 1864. The final trip along the Bridger Trail was documented by the veteran trader and Indian Agent, Major John Owen in September and October 1864. This train was also guided by Jim Bridger. He had returned to Fort Laramie from Virginia City, and by August 3 he was reinstated as scout on the government payroll. Owen's much publicized diary describes the trip in detail. However, his narrative stops suddenly after November 1, just prior to the train's arrival at the Shoshone River in the northern portion of the Bighorn Basin. On his second trip, Bridger concentrated on road construction to improve the trail, while making minor changes in the route as well. Therefore, this train took considerably more time to complete the trip than earlier trains. Owen's first diary entries list approximately 25 men who made the trip, however, some of the names are scratched out, and Jim Bridger's name does not appear at all. Regrettably, Owen failed to supply any figures for the number of wagons in the party: it may have been between 10 and 20.